Mam’s Barber & Hairstyling Salon – Providing affordable quality hairstyling services to the families of Kaneohe, Hawaii. Warunee Mam Hilacion moved to Kaneohe, Hawaii in 2002 from Thailand. Growing up in Thailand, she was enveloped in a culture that believes in strong family and community values. The people of Thailand particularly place special reverence on the elderly, and go to great lengths to treat all elders with the respect and care that you would give to your own parents. Warenee Man Hilacion brought this sense of community, along with a passion for hairstyling, to the people of Kaneohe by opening Mam’s Barber & Hairstyling Salon. Mam’s is a mom and pop style salon that caters to the entire family. Men, women, children, and seniors are welcome to come receive a wide range of hair styling services that will not break your family budget. Affordable Prices We believe that your family should be able to get the hairstyling services you need to look and feel great without worrying about spending a ton of money. As a small operation, we have very low overhead costs, and pass this savings along to our customers through low prices. With $15.00 haircuts for adults, and $12.00 haircuts for kids and seniors, our services are considerably cheaper than competing hairstyling chains. Experienced Stylists When you go to a generic franchise salon, it’s difficult to know the quality of styling services you are going to receive. Many of their employees may be just out of cosmetology school and be very inexperienced in the matters of cutting, styling, highlighting, or perming your hair. All of the stylists working at Mam’s have at least 12 years of experience in this industry. 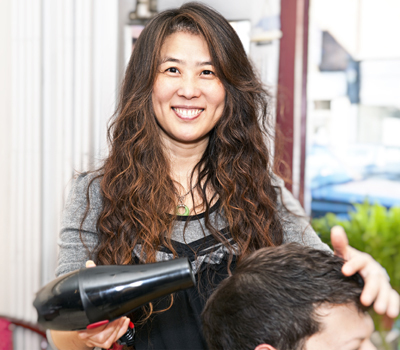 When you visit our salon, you know you can rest assured that your styling is in good hands. Feel Like Family Our Kaneohe Barber & Hairstyling Salon runs like a small family, and we treat each and every customer like a member. We go above and beyond to make our customers happy. Instead of viewing our customers as individual transactions, we see each visit as a chance to build a long-lasting relationship. If you have any special needs or requests, our friendly team will work to exceed your expectations. If you are looking for a Kaneohe, Hawaii hair salon where you can feel comfortable and get affordable quality hairstyling services, visit Mam’s Barber & Hairstyling Salon today. We look forward to getting to know you and your family.